Bosch Air Compressors - Full force guaranteed! Bosch Power Tools and accessories is one of the most trusted brands among the various accessory manufacturers in the world. Not only are they the largest manufacturer, they have an 80 year tradition of making the best products, trendsetting innovations for the contractor professional to the common DIY enthusiasts. Their trade mark Full Force technology ensures tools like Bosch Air Compressors to be smaller in size and lighter in weight. May it be Industrial needs, manufacturing product line processes, powering pneumatic tools, or using for DIY needs, air compressors lend a helpful hand. Bosch Air Compressors are handy equipment helping you with a range of application. One of the first companies to research on ergonomics, Bosch Air Compressors have excellent Grip area, creates less sound and have the control panel (switches and knobs) located according to right handed and left handed people. All these compressors are easily transportable in the job site and durable to handle the tough task of maneuverability. They can be easily maintained with uncomplicated operations. Air Compressors by Bosch primarily focus to build forceful packaged air that could be used for various pneumatic applications. Bosch has come with 5 new compressors from the 3 Gallon- 8 Gallon recently. These Air Compressors primarily come in two different kinds: The light weight Hand Carry Compressors and Wheel Barrow compressors. Hand carry compressors come in 4 Gallon & 3 Gallon tank capacity models. The following are the common features of Hand carry compressors: Hand carry compressors are CSA certified and a must for carpentry, framing, roofing and remodeling jobs. They have vertically angled tanks which balances the centre of gravity. This helps to effortless move around the job site. The patented EZ Drain system where the ball valve drain found in the control panel helps in draining tanks from the front of the system is an innovation. The 2 Pole Induction motor helps with lesser noise. The oil lubed pumps increases the longevity. The Roll cage is a big protection against accidental impacts. Producing 4.9 CFM @ 100PSI (pounds per Inch) and 2HP, this model comes with and without wheels. The difference in the 3 Gallon model is the 4 Pole induction motor, 2.6 CFM and 1HP motor. Wheelbarrow air compressors from Bosch are sturdy and durable. The 2 year pump warranty is a definite plus point. The angled EZ Drain system effortlessly drains along with sturdy Honda OHV motor. These tough soldiers weather extreme temperature conditions; they are made with cast-iron, contractor grade, oil-lubed pump. The cold weather demands extra protection and so the cold start valve prevents the compressor from blowing a fuse. They provide up to 125 psi to deliver consistent pressure. They weigh 175 pounds and are apt for heavy-duty applications of operating multiple nailers. These models have good handles which help in the balancing the air compressor and for easier movement and helps during loading and unloading despite its huge size. There have been consistent new models in the market from this manufacturer and only time would determine its weak areas. Trust the innovator! 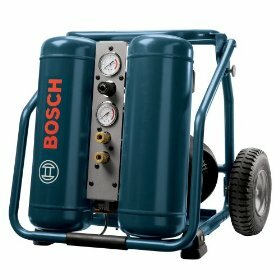 Return From Bosch Air Compressors Page to Home - Finishcarpentryhelp.com.